Expected to attract thousands of Tiger fans from around the country, Homecoming day starts with the annual parade through downtown Savannah beginning at 9 a.m. Marching bands, floats and decorated units will assemble on East Broad Street near Taylor Street and travel north on East Broad to Broughton Street, west on Broughton to MLK Jr. Blvd., south on MLK to Anderson Street and west on Anderson to Ogeechee Road where parade units will disband near the Economic Opportunity Authority building. 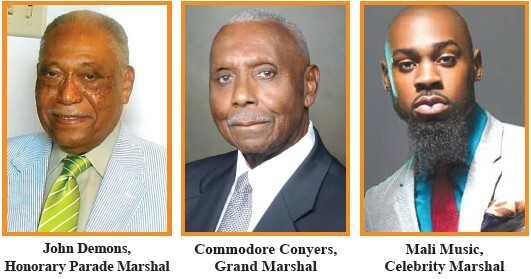 This year’s parade grand marshal is Commodore Conyers (’58) of Albany, Ga., while the honorary marshal is John Demons (’49) of Fort, Valley, Ga. Savannah’s own Mali Music will serve as celebrity marshal. At 2 p.m., the SSU Tigers will meet the Norfolk State University Spartans at Theodore A. Wright Stadium. General admission game tickets – $15 for youth, senior citizens and military; and $20-$30 for adults – may be purchased on the SSU athletics website: ssuathletics.com. On game day, stadium ticket booths will open at noon. A full schedule of events and other Homecoming details are available at www.savannahstate.edu.